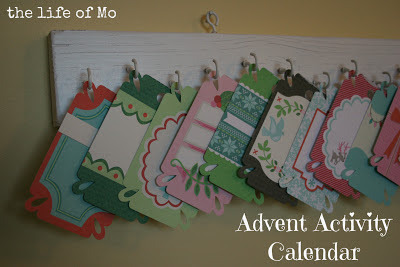 I just finished up an advent activity calendar for us! It's important to me that the whole presents/Santa/stuff part of the holidays be very minimal in our house, so I try to put a lot of emphasis on the really important (for us, the story of Christ's birth and serving each other) and the fun (making cookies, decorating, etc.) 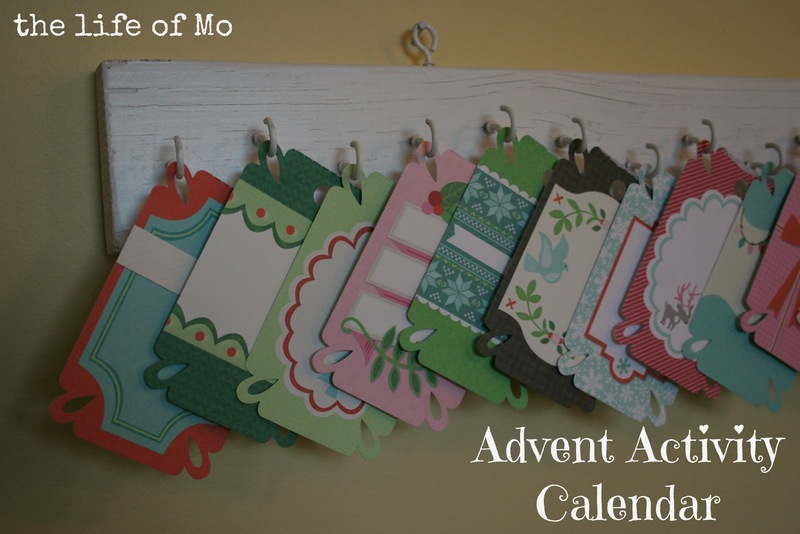 I thought it would be fun if we had an advent calendar with an activity for each day. I pretty much worked with what I had on hand. My supplies were: a piece of scrap wood from the garage, white spray paint, cup hooks, and a cute paper tag pad from Target (I found these near the scrapbook paper - I was pleased that there were exactly 24 sheets in the pad). I screwed 24 cup hooks in the wood in a staggered pattern - that got a lot easier when I started using Matt's drill to start the holes. I screwed two more cup hooks in the top (I pinched the hook closed with pliers) so I could hang it on the wall. Then I spray painted the whole deal. Conveniently, the tag pad has cute little cut-outs so I could just pop 'em up on the hooks. I still have to write numbers on the front. Our activities will be on the back on little post-it notes so I can move the activities around if I need to. I got the post-it note idea from Simple Mom. I hung it in our dining room so it will be convenient to check the activities everyday. Here's the list of our activities. What a wonderful and meaningful activity this will be each day! Glad you found all that you needed! Very creative as always. I think it will be a blessing for your family and especially for the girls. Dad and I were just saying how Christmas has gotton so commercial over the years; it is refreshing to see this. How meaningful for the girls; and a good way to build happy memories.